Having watched AMC’s The Walking Dead combined with a healthy appetite for my undead friends led me to sign up with Leaping Windows, India’s first online graphic novel library (only operational in Mumbai for now) within minutes of finding out about it. I had to get my grimy paws on the graphic novel that served as the inspiration for the series. Side Note: Leaping Windows is awesome. I signed up for the ‘Quick Fix’ deal, for three months. They came home, collected a cheque and delivered the first novel I had on my wish list, within 24 hours. As we speak I am, I’m holding Volume 2 of The Walking Dead, and sending a blood chilling moan of thanks into the heavens for this library. Volume 1 sees Rick Grimes, waking up to an empty hospital, presumably after being in a coma. The first 5 pages are alarming- a rotting corpse in the elevator, a lunch room full of creatures that look human, a garden with grass that has not been cut for what seems like weeks. The art work in Volume One is clean, crisp, and almost cinematic in its rendering. Maybe it’s because I’ve already seen the scenes played out in the T.V show, the word “cinematic” comes to mind, but not enough can be said about Tony Moore’s inking and grays that seem to create multiple worlds within a single panel. Walking Dead starts where every zombie movie ends. This time you will find out what happens after the first bite, and experience the grief of someone who has to leave a wife or a sister in a sea of boiling ghouls because they cannot be helped. We follow Rick in his journey to find his wife and son. The subsequent discovery of a camp site with a band of survivors that includes his family and best friend forms the crux of the first book in the series. 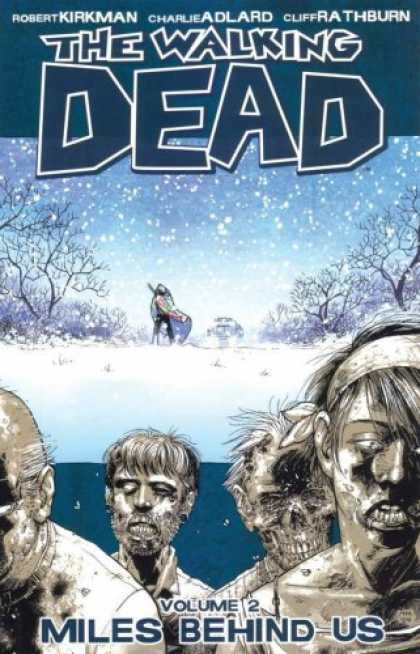 In Volume 2, Tony Moore is replaced by Charlie Adlard (though the cover is still very obviously a Moore) whose lines are rougher, more urgent and reach a feverish pitch in a panel that an attack was being depicted. The space between the attacking zombie and its human victim is reduced to a an angry black patch, perhaps indicating that there is really no difference between the two. The group of survivers, now under the leadership of Rick Grimes, decides to go on the road. Friends made in Volume 1 are lost, new friends are made. 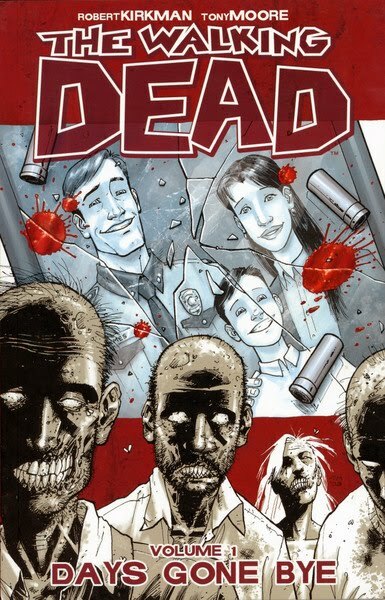 The introduction of Tyreese, a single father and his teen age daughter and Hershel, the farmer, who has a barn full of zombies on his land continue to add dimensions to this story. Lest you accuse me of being unnecessarily obsessed with zombies (you might as well actually, I have no defense. See also: Post before this one), the story of The Walking Dead is really not about The Walking Dead. Zombies, in this story can be replaced by any other catastrophe or threat. The focus really, is on the human beings. It’s times like these when the difference between the words ‘survival’ and ‘living’ makes itself very clear. It’s only under times of great duress that a man’s true character and intentions come out. And this zombie apocalypse serves as the perfect back ground for some postulation. Jab jaan ke vaande hote hai, bhai, toh then who do you turn into? By the window.Because cleaning my cupboard would mean I’m actually getting work done. Hope you can get your hands on the Walking Dead Compendium. Cover is $60 and I got a copy for $36. Hopefully, you can get a copy at a low price so you won’t have to use the library. The Compendium covers the original comic book issues 1-48, while each Book covers (I think) 12 issues. Farmville really Fingernails down everything you adore about Robert Kirkman’s The Walking Dead; the stress, the climate, your placing, the world, the way the tale moves. Merely every thing, perhaps the comic book graphics. (The Walking Dead actually is a comic strip series in the event you didn’t understand) Regretfully, I never received the opportunity examine each of the publications. The storyline is fantastic as well as their will be numerous shocks! Need to acquire!